MATERIAL: soft, smooth and breathable Softcool Extreme. Dries soft and doesn' t drip water. SIZE: 40 inch x 12 inch. Perfect around your neck as a scarf, headband or bandana and it can fold into a small, portable pouch. NEW COLORS: Blue, Green, Grey, Hot pink. Fashion and nice to handle for both female and male, adults and children. LIGHT WEIGHT & PORTABLE: folds up into a small pack and takes up little space in your bag, which is easy to carry with you in a waterproof pouch. SUPERB ABSORPTION & WATER HOLDING CAPACITY: cooling while absorbing sweat without dripping water at the same time, no worry about wetting your clothes. For sports & exercise: Outdoor ball games, fitness, running, camping, adventure, traveling, all of kind outdoor activities. For physical treatment: fever or headache relief, heatstroke prevention, sunscreen protection. For daily life: High temperature work, cooling while absorbing sweat for kitchen staff, outdoor workers, sports enthusiasts. ☃ EASY TO USE - Super Cooling Towels for Sports, Fitness, Gym & Yoga, gadget for sunstroke prevention and cooling relief in summer.Soak for 1 minute, wring out excess water, snap it few times and is ready to use. ☃ COOLING EFFECT - Instant Cooling Refreshing and Breathable, Sweat-absorbent and Dry quickly,The super absorbent fiber weave technology of the mesh towel regulates the water inside and ensures water retention. ☃ MULTIPURPOSE - Ice microfiber towel is perfect for athletes, runners, sports fans into workout, gym and fitness. Its super absorption ability you can also use it as yoga towel, fitness towel, sports towel, gym towel or golf towel. 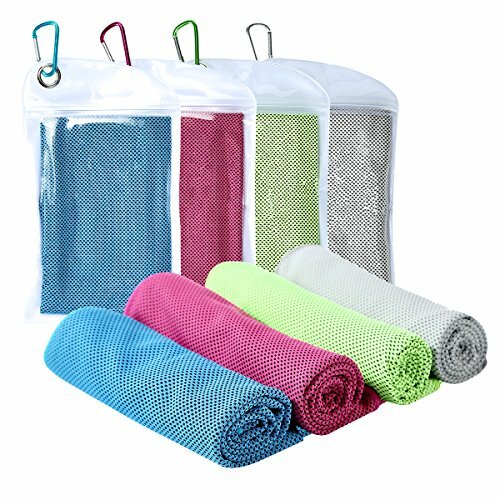 ☃ MATERIAL - Hyper-evaporative breathable mesh material,Working on the physical evaporation of moisture, no chemicals are used in the making of the cooling towels.Cooling towel is silky soft, pliable, easily folds up. the lightweight towels used for absorbing water and absorb sweat, let you stay dry when high intensity of exercise, achieve UPF 50 SPF. If you have any questions about this product by GooKit, contact us by completing and submitting the form below. If you are looking for a specif part number, please include it with your message.